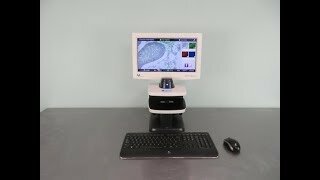 The Life Technologies EVOS FLoid Cell Imaging Station brings you an easy to install, simple to use alternative to microscopes that’s great for small demonstrations or large presentations to a crowd. This compact and affordable imaging system provides quick detection and verification of fluorescent labeled samples, right at your workstation. The FLoid makes use of transmitted light and three-color fluorescence lights to capture images with crisp clear fidelity. This imaging station combines high quality optics in the form of a 20x plan fluorite objective, and digital zoom and scale bar for comparison, with detection in 3 channels consisting of DAPI, FITC, and Texas Red filters. Transmitted light images show cells in terrific contrast and prevents light loss with the innovative light shield. This light shield allows users to place this imaging system wherever they need it the most, no more dark room necessary. The Thermo EVOS FLoid Cell Imaging Station is user friendly, no matter your experience level, with real time color display lets you capture high quality images quickly and easily. The fully integrated, icon based operating system guides users through an uncomplicated interface, in multiple languages, without need for warm ups or cool downs or even filter changes. And with no moving parts or bulbs to change out regularly, this cell imager can provide reliable use day after day, year after year. The open stage design of this imaging system lets you choose what vessel best suits your needs, including slides, multi well culture dishes, even T75 flasks. Images captured can be saved out in JPG, TIFF, BMP, and PNG. This Thermo EVOS FLoid Cell Imaging Station is in excellent condition and has clear optics. All of our lab equipment comes backed with our standard warranty. Should you have any questions, please don't hesitate to contact us.